Makoto Ueno was born in a family of musicians in 1966 in Muroran, Japan. His grandmother and father were both organists in a local protestant church, and they exerted the first musical influences on him. He left his home town at the age of 16, to study in the West, first at Curtis Institute of Music in Philadelphia, where he studied with Jorge Bolet, then continued at Mozarteum Salzburg with Hans Leygraf. In his formative years, Ueno also received instructions and suggestions from such diverse artists as Mieczyslaw Horszowski, Gary Graffman, Edward Aldwell, Felix Galimir, Leon Fleisher, Rosalyn Tureck, Andrzej Jasinski, Radoslav Kvapil, Jacob Lateiner, among others. In addition, the writings and musical thoughts of Heinrich Schenker, Wilhelm Furtwängler, Sergiu Celibidache, Alfred Brendel, Glenn Gould, though they are tremendously different from each other, influenced him in his early years. He was a prize-winner at various international competitions such as Maryland, Bösendorfer=Empire(Brussels), Geneva, Orléans. In Japan, he was a recipient of the Kyoto City Prize for New Artists, and of the Aoyama Barocksaal Prize, in 2005. In the same year, he won the Second Prize at the 1st Sviatoslav Richter International Piano Competition in Moscow. Although Ueno usually plays modern concert grand pianos, he is equally at home with historical instruments. He often performs on Viennese and British fortepianos from 1800 to the 1830s, and on a Pleyel, Streicher, Erard, Bösendorfer of 1840s to 1900. Ueno has been very active in the field of CD recordings in recent years, especially using instruments of the 19th Century and early 20th Century. Many solo recordings have been released by Octavia Records and Wakabayashi Koubou labels. His latest solo CD releases include an album of Liszt works with an Erard from 1851, a disc of Chopin Sonatas with a 1846 Pleyel and the 1851 Erard, a recording of Rachmaninoff and Debussy played on an American Steinway made in 1925, and a disc dedicated to the works of Wagner=Liszt, Debussy, Scriabin, Schoenberg, and Ravel, played on a historic Bechstein E made in 1906. Also several recordings of chamber music by Moscheles and Czerny, with flutist Kazunori Seo on Naxos have been released in 2014 and 2015. Future releases in 2017 and 2018 will be a Brahms solo album on a 1846 Streicher and a 1903 Bösendorfer, albums of chamber music by Beethoven and Weber on a Bösendorfer Imperial 290, and a disc dedicated to Schumann Lieder from 1840 playing on a Bechstein EN. In 2018, a project of performing the complete violin sonatas of Beethoven, using the original period instruments such as Mattaeus Stein(attrib. ), John Broadwood, and Conrad Graf, with a violinist Yasushi Toyoshima, is planned. 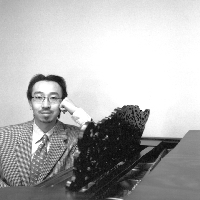 Since 1996, he has been teaching as a professor of piano at Kyoto University of Arts. In addition to his teaching at other Japanese universities and institutions, such as Toho Graduate School of Music, and Nagoya University of Music, he has served as a jury in major piano competitions in Japan, and written articles and essays for various Japanese music magazines. He has given masterclasses also in Korea, Thailand, Germany, Turkey, and Portugal. Copyright © MAKOTO UENO, ALL RIGHTS RESERVED.